It was one in the morning in early February in St. Cloud, Minnesota. A small group of people assembled on the shores of Lake George, an over-sized pond in the middle of the city. That year, Jolt Cola was a sponsor of the contest and one of the items the company provided were jock straps with the company’s logo on the cod piece. This spurred one of the teams to issue a challenge that would cement the legend of the “Lake George Streaking Incident”. This was the first attempt by Captain. F to jazz up the beginning of Trivia. The lead-in tradition up to this point was a multi-part theme based audio theater production lead by Historical Trivia Individual Al Neff. The audio theater was an incredibly complex undertaking worthy of its own laudits; however there still lacked a transition between the theater and the start of the contest. This year Captain F. produced a retro trivia montage of audio from years past and this intro was tacked on the end to signal it was time for hour one. 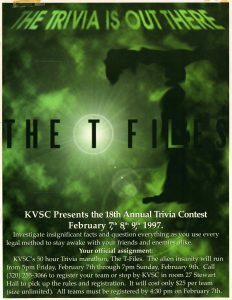 Captain F. can be heard saying “The Trivia is out there” which is taken from The T-files audio theater production where he was tapped as the series announcer. Gag reels are not a new concept however The Goat Posse didn’t know this particular part of Trivia weekend would become so much fun. With the help of a few sound effects CDs, the random calls when linked together seem to suddenly make sense. 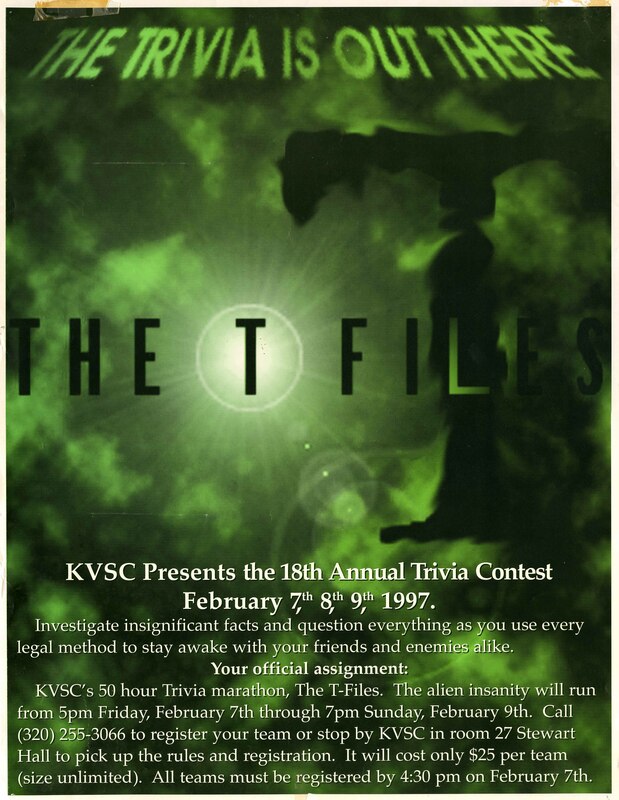 One of the most infamous challenges every attempted was also a triumph of media coordination as both UTVS and KVSC showed up in the middle of the night to cover the proceedings. For KVSC, Dave Lee had the call. It would not be his only observance of the night as he also witnessed some chicanery between police officers and their off-duty co-workers inside a house where they were playing on the 2002 Hall of Fame honorees Pig R’ Us. Those Meddling Kids would rule the mid-90s for the sheer volume of challenges made. This time they keep the pressure on Uncle Corn to reveal the most intimate secrets about his cob. This theme based top ten makes some worthy predictions. It also is the only place that would likely mention former Vikings Wide Receiver Cris Carter outside of a Thor Tolo radio show. Adapted from a Tom Barnard KQRS Morning Show skit, Dude does a great job as Jerry Burns admonishing Trivia players about their challenge line language. With the advent of digital editing programs it became easier to collect and organize random clips from challenge line calls. Ursula Fabuline’s call set the stage for The Goat Posse’s love of Trivia out-takes. Captain F. dug into the Trivia archives to treat listeners to some memories of the past. 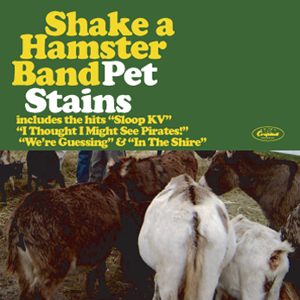 It was a huge year for the Hamsters in 1997, they produced nine songs and one of them Work The Phone Bank was written to honor the Posse. Captain F. drifted into the Hamster Den during the contest and heard strains of Rock The Casbah, wondering what the Hamsters had planned. It was not til later that Mugsy Hamster would pull Captain F. aside and say, “Did you hear your song?” The homage to the Posse was appreciated and Captain F. danced like a groupie on stage at the Red Carpet when the song was played. The second installment in the Stink Rock series. Like the original Stink Rock, it was not conceived by the Goat Posse, but is the inspiration for all future editions. Producers: Aaron, Chris, Dave Lee.